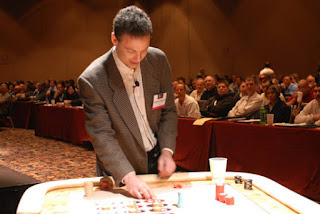 Yes, I am still training table games people via seminars and more intense training classes and courses throughout the world. I want to emphasize the difference between my casino table game training seminars and those offered by the others calling themselves world game protection consultants and experts. That difference is simply: I train by hands-on training, imparting my knowledge as both one of the world's greatest casino cheats of all time and that as a dealer ripping off casinos from the inside. Do not forget that I was the first to do the false-shuffle baccarat scam as a casino dealer before the Tran Organization made that scam so infamous. I teach casinos how to defend against all scams and advantage play methods. I do not waste anyone's time or money with PowerPoint presentations or overused surveillance video of scams that do not really teach anything. If interested in my services, go to my website game protection training page and contact me.